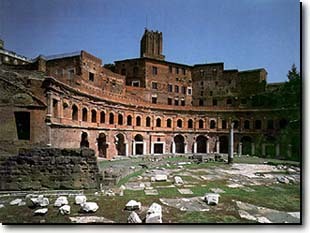 The complex, placed between the Trajan Forum and the slopes of the Quirinal Hill, is a sequence of rooms used as shops. In the direction of "Via Nazionale", there is a large room which represents the centre of the whole complex. The façade of the Mercati Traianei consists of a large two-storied brick hemicycle and is dominated by the tower of the Army which was built in the XIII century as defensive work.On both sides of the tower there is a large semicircular room covered with a half dome, probably used as concert-hall. The most important part of Mercati Traianei is the "Sala" which is a building covered with cross vaults, having twelve shops on two storeys. The Mercati Traianei can be considered the first example of a covered shopping centre in history.